The consultation is designed to identify and examine the barriers faced by disabled people who want to be involved in local and national politics; and most importantly how to tackle these barriers. If UK politics were to be fully representative of disabled people, you could expect to find at least sixty-five disabled MPs. The consultation comes as the result of a commitment from the findings of the cross-party Speakers’ Conference in 2009, which looked at the lack of representation in parliament and how to increase diversity in UK politics, by tackling the barriers that face many under-represented groups in society. Firstly, attitudinal barriers were seen as being detrimental to the prospective chances of disabled people in politics. The consultation states that the electorate has reservations about being represented by a disabled individual for various reasons. It is stated that disabled people are twice as likely to live in poverty and twice as likely to go to further education. Furthermore, unless potential disabled candidates are supported through training and development opportunities, these stigmas will persist. Financially, another barrier presents itself to disabled candidates. Alongside the standard costs when running for candidacy, a disabled person would encounter extra costs; for instance a deaf person would have to pay for a British sign language interpreter. Moreover, accessibility and mobility can become very difficult for disabled people. Government should work more closely with political parties, the Local Government Association (LGA) and disability organisations to develop focused awareness raising. Work with political parties, the Local Government Association (LGA) and disabled people’s organisations to develop a cross-party ambassadors programme. Provide training and development opportunities aimed at supporting disabled people through the route to political participation. Establish an Access to Elected Office Fund to support disability related costs. Work with political parties to analyse their existing disability access policies and cascade and promote any good practice. Promote and explain legal obligations that apply to political parties, e.g. develop a short guide, website materials and/or a toolkit to support local authorities and political parties fulfill their duties under the Equality Act. The proposals will apply to candidates who are applying to the following list of elections; UK Westminster elections, English local elections, Greater London Authority (GLA) elections, English Mayoral elections and Police and Crime Commissioners. There will be continued discussions with the devolved administrations in order to provide an effective forum for replicating good practice. This consultation began on 16 February 2011 and will end on 11 May 20. You can download the consultation document via here (PDF). 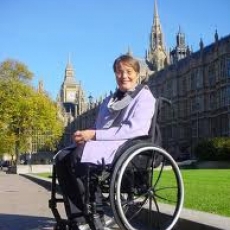 Picture: Dame Anne Begg, DBE. Labour MP for Aberdeen South. Submitted by sadieei (not verified) on Tue, 12/04/2011 - 18:47. Submitted by Leon Green (not verified) on Wed, 13/04/2011 - 14:43. I've added a link to the consultation document at the bottom of the piece above.